This is visual learning at its best. 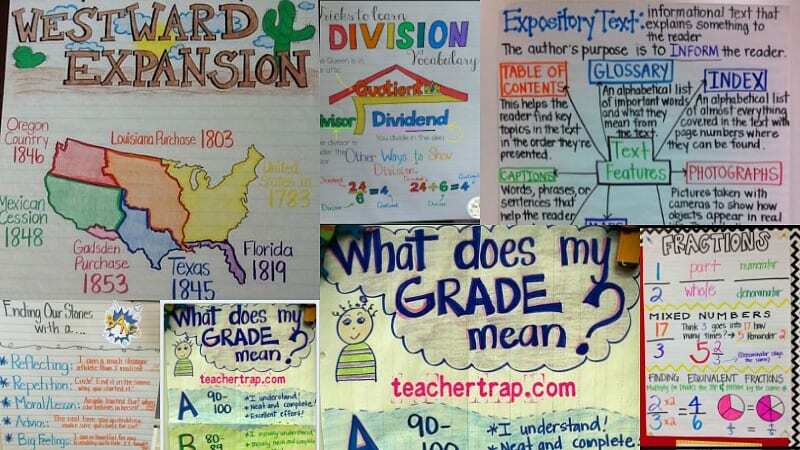 We pulled together our favorite 5th grade anchor charts to encourage visual learning on several key concepts. If you have favorites to share, please leave the link the comments section! 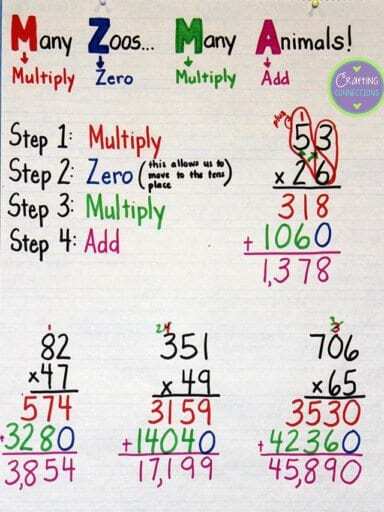 Using an acronym to remember the steps to take when multiplying larger numbers will help kids remember what to do next. 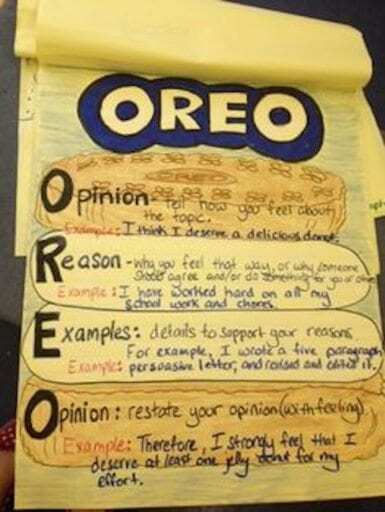 What better way to teach a writing idea than with an acronym that is a delicious cookie. Often kids get to the end of writing a story and they run out of gas. 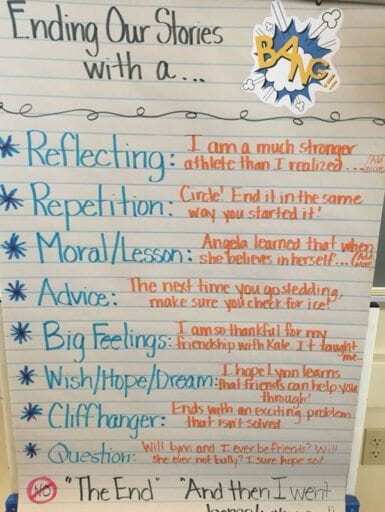 Give them some ideas with this chart. This teacher has some serious art skills! 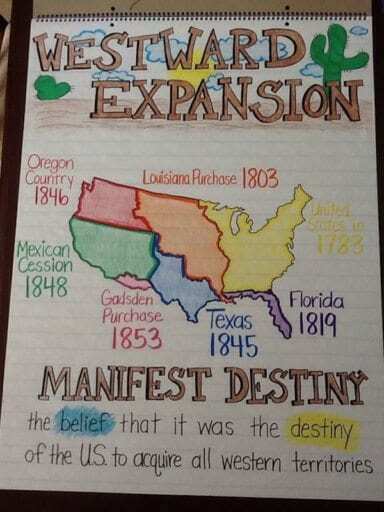 And found a great visual to show kids when the U.S. acquired different parts of the country. 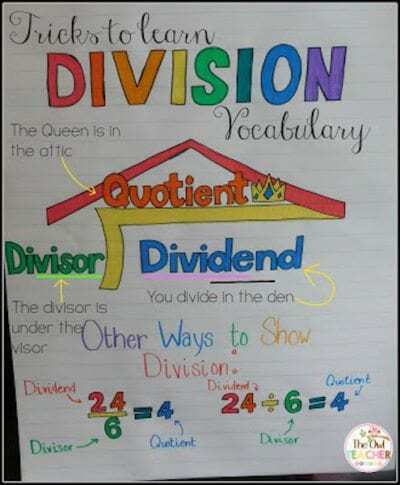 Divisor, Dividend, Quotient…do kids know the difference? This colorful chart will help them figure it out. 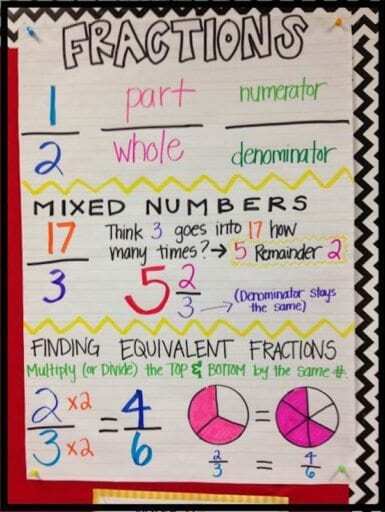 This chart helps kids see how to find equivalent fractions as well as using mixed fractions. 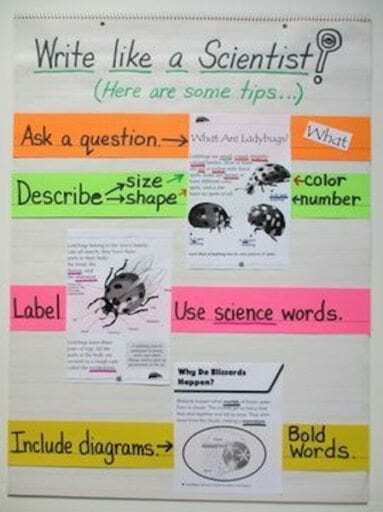 This chart shows how to use words to inform, describe and label a topic, just like a scientist. 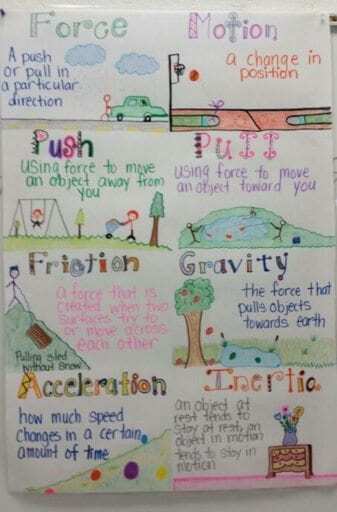 This chart colorfully shows the different stages of motion in matter. 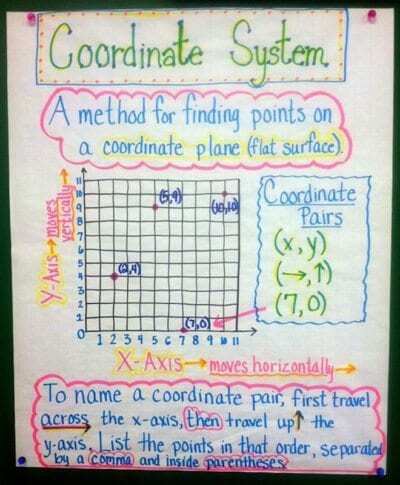 Here’s a chart for helping kids find coordinates on a plane with an x or y axis. 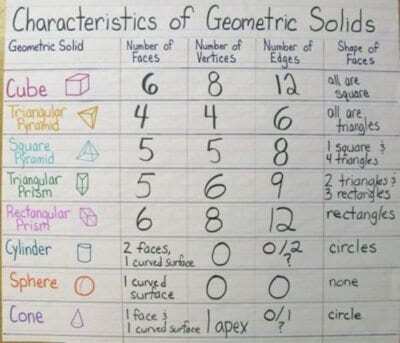 If kids get mixed up on the number of sides or faces on a geometric shape, go through this chart together when you want to refresh the idea. 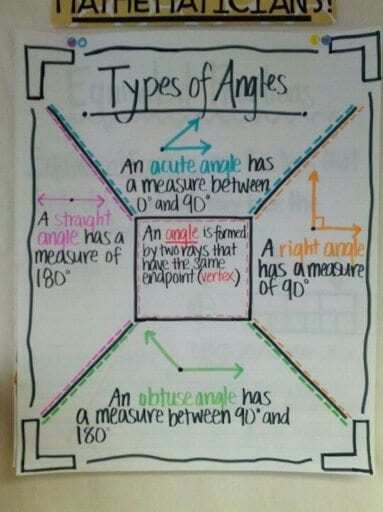 When teaching the concepts of angles, this chart is a fun one to illustrate together with your class. 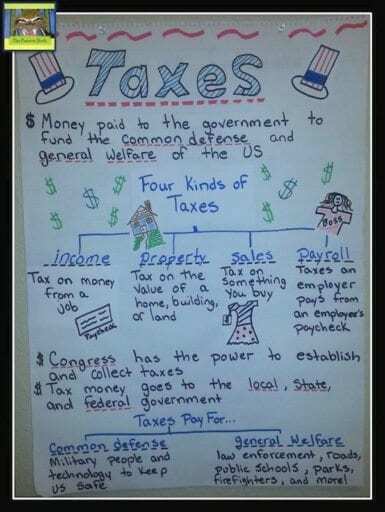 It’s not a bad idea to get get kids understanding taxes…and why their parents pay taxes and what the money is used for. 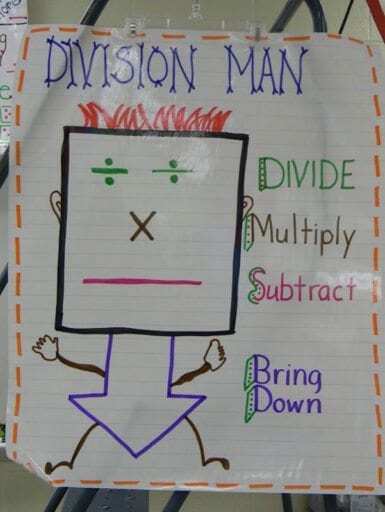 He looks a little somber, but division man is very helpful when kids are trying to remember how to use long division. 14. What does my grade mean? 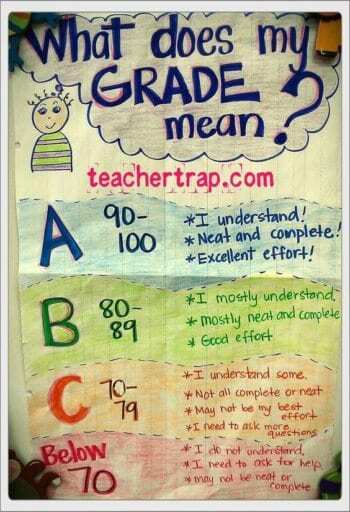 If kids are confused by a letter grade, post this chart so they can better understand what differentiates an A or a C grade. Often more than words are needed to explain a topic or subject. 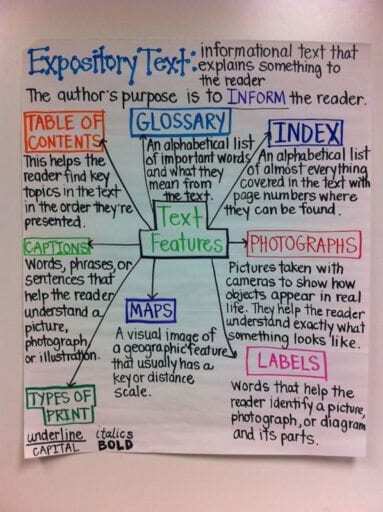 This anchor chart helps to see some of the ways that can explain something to the reader in text or visual form. 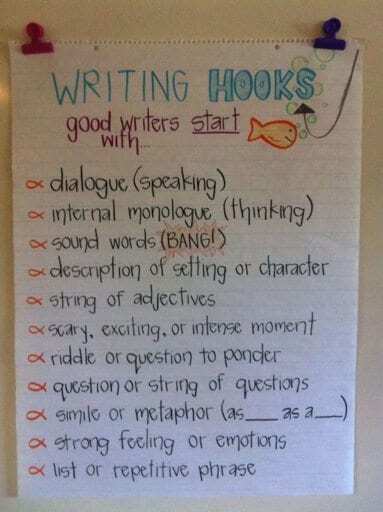 In a writing workshop, this is a great chart to get kids thinking about how they want to draw in readers to their stories. 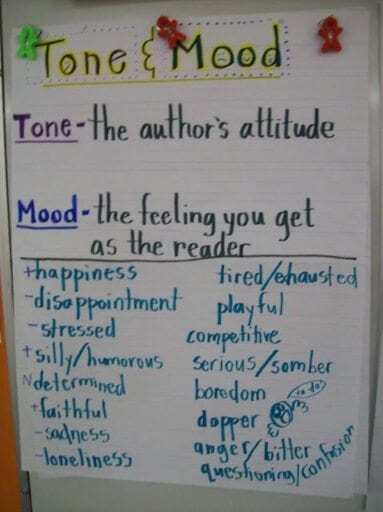 A reader can tell a lot about the story by figuring out what the author’s tone and mood are. This chart explains the difference between the two words and gives some examples of them to the students. 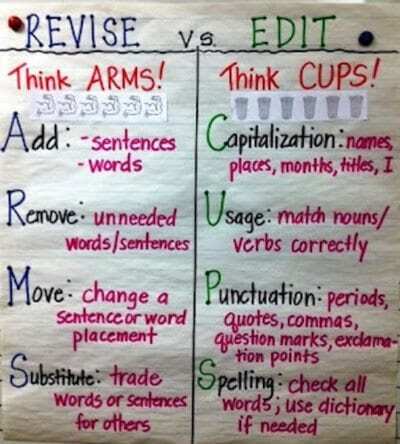 Revise and Edit might sound like the same thing, but this anchor chart shares the differences, and gives a helpful acronym to remember them! The paragraph sign is really cute and fun, but how do kids know when to change paragraphs? 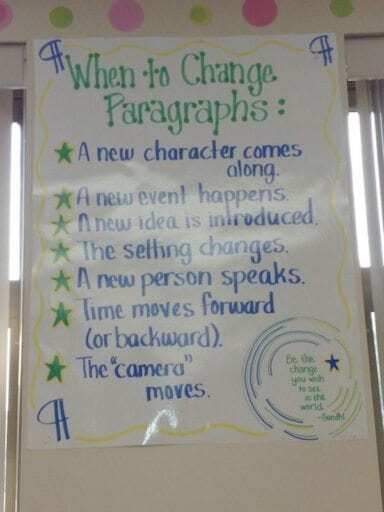 This chart gives some ideas when a new paragraph is needed. Change is inevitable, especially when it comes to our weather and our earth. 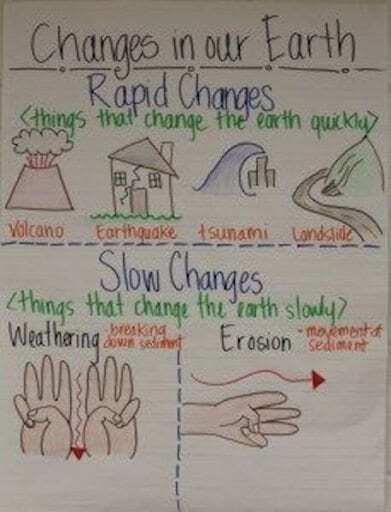 Explain the differences between rapid and slow changes with this handy chart. Disagreements will come, but 5th grades know that they can figure it out together. 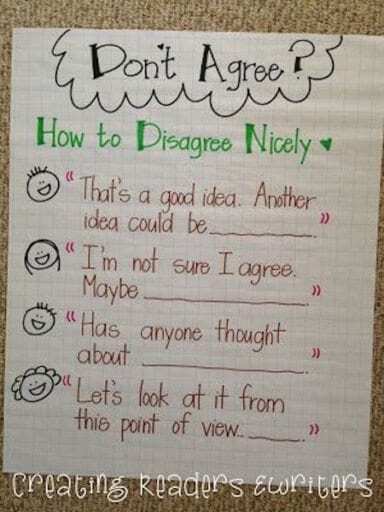 This chart helps them see that you can disagree…just do it nicely. 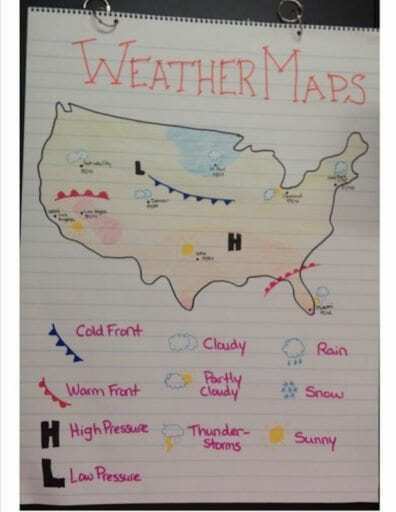 Weather patterns are fascinating to a 5th grader. Encourage kids to watch the weather on their local news station and then go through this weather map together as a class. 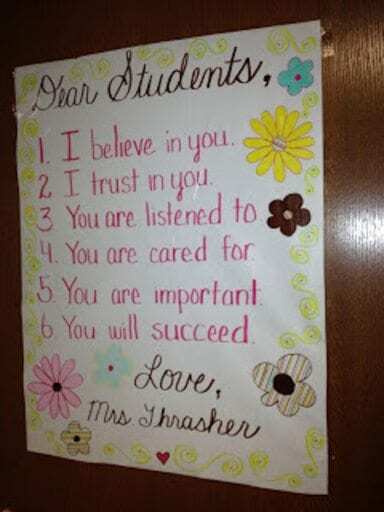 Fifth grade can be tough emotionally for these maturing kids. Remind them how you see them and tell them every day.